Among the biggest independent record labels in American music history, Atlantic Records stands taller than all but one, Berry Gordy’s Motown empire. None though spent more time courting the historical chroniclers of rock music to ensure lasting credit for their contributions more than Atlantic’s founder, Ahmet Ertegun, a savvy, charming and erudite figure who eventually became almost as famous as the biggest stars his label recorded over sixty years with him at its helm. By the late 1960’s, with an entire generation or two having come of age with rock as an omnipresent fact of life, the music started attracting studious young researchers interested in serious historical overviews of what was – until then – considered by the academic and publishing communities as little more than frivolous teenaged entertainment. Their efforts to legitimize it however, amaturistic as they often were, set into motion the field that Spontaneous Lunacy now shares with them (uncomfortably for both them and us I assure you), that of rock historian. These historians set out to recreate the rise of the music by interviewing the participants for first hand accounts of the travails along the way from rock’s birth as a fringe movement to its gradual takeover of popular culture. But since many of the artists involved in rock’s creation were deceased or had returned to obscurity by that point, while the successful ones had little reason to look back when they were still intent on looking forward and getting more out of their careers, that left the label owners who had an intimate familiarity with ALL of the artists in their sphere, not to mention the records they made and the environment they all existed in. Furthermore these men seemed somehow more approachable to the largely inexperienced writers in this nascent field of endeavor, whereas the artists who those writers had grown up worshipping seemed intimidating in their larger than life personas. A record label owner by comparison must’ve seemed like little more than a better dressed, more successful version of the writers themselves. And so it was that Ahmet Ertegun began to receive interview requests, not about whatever the latest Iron Butterfly record Atlantic was putting out, but rather asking him to tell them about the early days when Atlantic was just trying to sell enough copies of the latest releases of Tiny Grimes and Joe Morris to pay off their most persistent creditors. It must’ve seemed like an usual request but Ertegun was no dummy, he quickly saw the potential advantages if he went along with it. While his most successful competitors Syd Nathan (King Records) and Leonard Chess (Chess Records) were recently deceased, and others like Lew Chudd (Imperial Records) and Art Rupe (Specialty Records) were out of the business by now, living in retirement and largely unwilling to go back in time and recount these stories for reasons they couldn’t fathom, Ertegun understood how he could benefit from it. He could in essence write his OWN story by merely making himself available, turning on the charm and giving the often novice writers un-used to being manipulated, the answers they sought… but deftly spun in a way to make himself look good, in the process laying the groundwork for his own deification. To do so required a few stories designed to simultaneously impress and enlighten the interviewers, topics that were just off the beaten track in terms of familiarity of the subjects, and thus were ripe for picking. Just as Sun Records Sam Phillips did so for those who came to him seeking information on Elvis Presley or Jerry Lee Lewis’s early careers by steering the discussion to his supposed role in rock’s birth by recording Rocket 88, thereby helping to improve his stature and keeping him from becoming merely a footnote in Presley’s mammoth career, so too did Ahmet Ertegun who had even a longer and more diverse résumé with which to pull out whatever record, whatever story, best fit the bill. One of his favorites over the years was the tale of how he, in early 1949, in the business just over a year with little success (always show some humbleness, especially if you can then allow the ensuing legacy of the company gotten from that story act as its own form of bragging), managed to secure the company’s first MAJOR hit with a few sharp moves designed to subtly let the interviewer, and thus the reader, know that he, Ahmet, had gotten to where he was now (a multimillionaire and social icon) by being smarter than everybody else. The story centered around Stick McGhee, an otherwise largely forgotten figure in music history, who wound up with a #2 hit on the Race Charts thanks to Ertegun’s quick thinking and unparalleled instincts. You’ll be forgiven if you’ve heard all of this before. As stated, Ertegun told the story to anyone and everyone with even a passing interest in music history, so I’m sure you’ve come across it in some form over the years, but it really IS a good story and needs to be fully understood to put the record’s success in context. (Hey, it’s better than singing The Army Goes Rolling Along or joining in pre-dawn Reveille). After the war McGhee attempted to make a career out of music and was signed to the small Harlem label, one of the few at the times run by a black man, J. Mayo Williams, who’d supervised recording sessions for blues and jazz artists for Paramount Records starting in the 1920’s and in 1934 oversaw major label Decca’s race division making him the most powerful African-American in the industry at the time, not to mention one of the ONLY ones entrusted with doing anything more than sweeping out the studio at night. 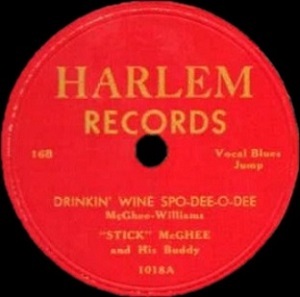 Williams left Decca in 1945 to start his own Harlem Records and in 1947 Stick McGhee laid down his original version of the re-worked barracks ditty for the label, omitting the profanity which was surely its most appealing quality for those dressed in olive drab cleaning latrines all day, and replaced it with the somewhat nonsensical “spo-dee-o-dee” (“somewhat” because the term itself comes from a cheap mixed drink of whose origins and evidence of its widespread usage are a little vague. This term also may have been Williams’ concoction, as he did get co-writer credit for it and certainly had more of a creative background in music than most label heads claiming authorship of songs down the road). Regardless of its veracity the song itself was pretty decent but the Harlem label was small and without much in the way of national distribution, promotion or exposure to spread the word about the record so realistically all they could hope for was some local sales around New York and maybe a few far-flung locales, perhaps enough to draw a bigger company’s interest and let them handle its wider distribution for a cut of the action. That’s kind of what happened, though in a far more roundabout way than usual and with no benefit to Williams and Harlem Records. Somehow somebody in New Orleans got a copy of the two year old record and played it on the air and it took off. Everybody in the black community wanted a copy, yet for some reason (maybe the fact its sales were not coming from the Harlem Records connections, but rather used copies and bootlegs) the normally astute and certainly very experienced Williams was slow to capitalize on it and distributors in the Crescent City, who might go months without a really big record to push, were desperate to get more copies any way they could get them. One of these distributers was on the phone with Ertegun who was equally desperate… to have his own meager output on Atlantic pushed down there. The distributer told him he’d take a measly thirty copies of one record, hardly worth the expense of shipping them down really. But during the course of the conversation the distributor happened to mention the McGhee record and added that if Ahmet could secure five thousand of those he’d take all Ahmet had, giving him a modest cut in the bargain. Bells went off in Ahmet’s fevered brain. His first thought was finding copies for himself, but he was prescient enough to ask the distributor to send him one so he could hear it for himself to make sure he tracked down the right version. But once he heard the record he got an idea to re-record it with another blues-type singer and release his own version, in effect obliterating the two year old record that was hardly going to be able to compete if it was no longer being pressed, shipped or promoted. However Ertegun didn’t know many blues artists in New York, certainly never heard of Stick McGhee before learning about this record, but he did know one blues act around town – none other than Brownie McGhee. Brownie McGhee and Sonny Terry were the leading proponents of the Piedmont Blues style, already something of an archaic blues form more closely aligned by this time with folk music than the electric blues that was gaining traction in the marketplace. Ahmet called Brownie to ask if he’d be willing to do a session to cover this song. When Brownie heard the title he replied, “That’s my brother’s record!”. Stunned, Ahmet asked if he knew where he could find his brother and Brownie said, “He’s right here!” and put him on the phone. Thus in a totally improbable series of events Atlantic Records turned the corner from struggling label to a label with a legitimate hit. 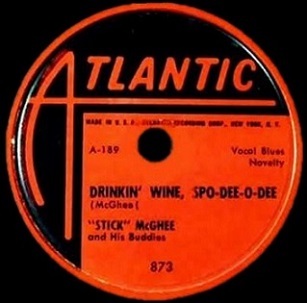 Stick came in to re-cut Drinkin’ Wine Spo-Dee-O-Dee, having no contract with Harlem to honor (or to break, having been paid 75 bucks and some hot dogs for lunch when cutting the original version), and with the addition of Brownie on guitar and harmony vocals they modernized it somewhat – not to mention Ahmet’s one real creative wrinkle artistically, which was to change the first line from “Down in Petersburg” to “Down in New Orleans“, thereby forging an even greater connection to the city in which it was already popular. When it was pressed Ertegun sent it to his New Orleans distributor and it sold like crazy there, not to mention spread nationwide and suddenly Atlantic Records had some breathing room financially and never looked back, methodically building a musical empire over the next twenty years. You gotta admit, as rags to riches tales go, that’s pretty good. As for the record, or records plural, Drinkin’ Wine Spo-Dee-O-Dee is about what you’d expect for its crude off-color origins. An extremely catchy, wholly enjoyable tune – easy to sing along with, possessing a joyous bounce and a loose natural feel that gave it an instant familiarity even to those who were hearing it for the first time. However the musical, structural and stylistic differences between the 1947 Harlem original version and the 1949 Atlantic update have been vastly overstated through the years – by Ertegun and others who took his telling of how they drastically re-worked it (which in Ahmet’s story is what made it so big) at face value. The truth is they’re more similar than dissimilar. There are two primary changes of note though, aside from the shifting of locales it’s set in. The most prominent change is the earlier version had been played much faster. The original on Harlem Records is actually a full minute shorter as a result of its quicker tempo, 2:18 compared to this one’s 3:14 running time, though Atlantic’s comes off as a tighter arrangement because it doesn’t sound as if they’re hurrying through it before the MP’s catch them making a racket after lights out. The slowed down pace makes the lyrics, which are the same in both, come across better, as you get a chance to let each line sink into your consciousness and more fully envision the colorful circumstances they’re describing. The other change is the addition of drums which definitely DOES modernize it, adding a driving beat to it that connects it even more firmly to the rock listener’s aesthetics. Everything else though is pretty similar. Stick’s own guitar is joined by Brownie’s biting electric, but only in responsorial lines until the solo, which is clean and tight, hardly flashy but fitting perfectly. The give and take of the vocals though is the same, the roll call of wines, the shouted “Mop-Mop” and “Hoy-Hoy” interjections are all there in both takes on it. Stick DOES sound older here, more confident and in control, but two years will do that to a person, as will the fact that this time around a record label was actively seeking him out and perhaps that gave him some additional swagger to tap into. But overall the versions are simply slight variations. Listen to a modern artist in concert sing the same song two years after it came out on album and there’ll probably be even more noticeable changes than are found here. Still, the Atlantic version IS superior for those changes, not to mention possessing slightly better fidelity, and it certainly was a well-deserved hit. For a record whose legend looms so large it’s also nice to report that Drinkin’ Wine Spo-Dee-O-Dee is a case where the recording actually DOES live up to its reputation. Its impact for the label was also no exaggeration, as a hit of that size, coming off a smaller hit by Tiny Grimes and consistent sellers by Joe Morris, gave notice that Atlantic was on the rise. Ertegun had every reason to be proud of the fast-thinking and fortuitous turn of events that got him that hit and was entirely justified in crowing about it from time to time. That it became so oft-repeated is as much a residual effect of the nature of multiple writers covering the same ground (now, I suppose, you’ll have to add me to the list, even though I went about this by trying to shine a light beyond just the particulars of the story itself) as it is Ertegun’s desire for self-aggrandizement. I can’t begrudge him the urge to do so, at least at first. For him Atlantic Records had been a long, hard struggle to get to that point of being successful enough to not have to worry about going under, and to have the means with which they achieved that success come from his own scrambling efforts was a legitimate source of pride, even a half century later. But in the process of Ertegun’s telling, and re-telling, this story to eager reporters and historians over the years, all with the clear-cut purpose to promote himself along with re-affirming Atlantic’s stature in the music biz, Stick McGhee became little more than an afterthought in the tale. An incidental figure in his OWN success story. Remember, it wasn’t Ahmet Ertegun who shaped, played or sang the song, it was McGhee. His voice was the one capturing listeners ears, just as it’d been his voice on the 1947 version which had done the same when it got played over the air New Orleans and which had started this tangled road to hitsville in the first place. And while it was Ahmet’s canny decision to issue this remake Ertegun also was the one who completely misread the market on McGhee at this juncture, cutting and releasing pure blues for the B-side to this, as well as both sides of his next single, all while the OTHER scintillating rock side cut during that initial six song session (Tall Pretty Woman) only saw eventual release on a little heard album years later! Had that one been put out as a single to follow this up a few months later with an eager audience anticipating his next record who knows how big of a hit that might’ve become and maybe expedited Atlantic’s rise to the top even more. Today McGhee might be a more recognizable name because of all of this, just as Drinkin’ Wine Spo-Dee-O-Dee is surely heard far more often today as a result of the accompanying legend that surrounds it thanks to Ertegun’s ongoing efforts, but McGhee’s own role has been diminished, just as his own career as a whole has been reduced to one record, seen more of as a fluke than a sign he was a viable artist with genuine talent. Neither of those outcomes are exactly fair. Nobody asked Stick McGhee for his side of the story. After some excellent sides (and one additional big hit) on Atlantic which followed over the next few years, McGhee bounced to a few other big labels and STILL was cutting solid rock records as late as the mid-50’s all of which we’ll get to in an effort to rehabilitate his legacy. Even his final sides cut in 1960, long after his brief moment in the sun had passed, were worth hearing. By then Atlantic was no longer struggling and no longer in need of Stick McGhee and a heavy dose of sheer luck and good timing to make ends meet. When he died the following year in August 1961 at the age of 43 of cancer Atlantic records had multiple records on the charts, one having just dropped out of the Top Twenty, another on its way into the Top Twenty soon, with yet another that would match that feat just being released as they lowered McGhee into the ground. If not for Stick McGhee it’s doubtful those records would’ve come out on Atlantic because the label might not have lasted half as long as McGhee himself did. Rather than constantly praise the one behind the scenes who reaped sixty years of financial benefits from the label’s unusual success story, in the process earning a reputation that almost assures him of virtual immortality in the annals of the music business, let’s instead celebrate the soon forgotten artist who made all of that possible in the first place. 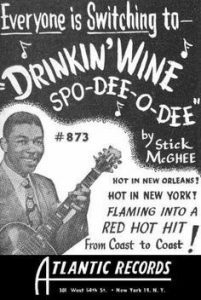 Leave a reply on "Stick McGhee: “Drinkin’ Wine Spo-Dee-O-Dee”"